A project corresponds to a specific directory on the disk. The project is presented in the Navigator View - a file browser component that helps you browse the project directory contents. For more details see What is a Project. 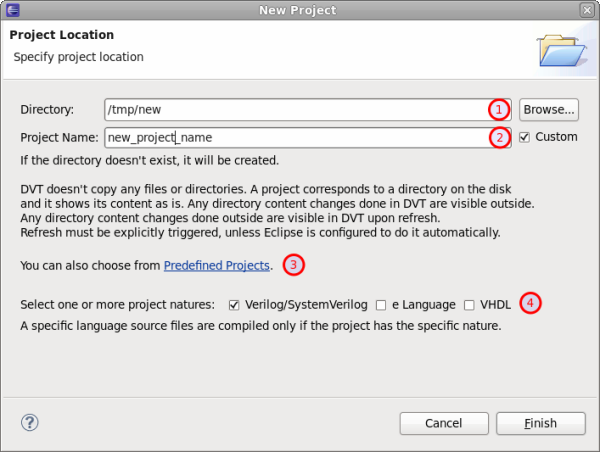 Invoke the New Project Wizard: choose menu File > New > DVT Project. Specify the Project Directory It can be a directory that already contains sources or a new directory that will be created. Specify the Project Name By default, the project's name is the last segment of the project's directory path (e.g. /tmp/path1/path2/p_name > p_name). You can change this name by selecting Custom. NOTE: If Project Directory points to an existing project, you cannot change its name. Open a Predefined Project You may open one of the predefined projects that DVT ships with and continue to explore the DVT features. For more details see Predefined Projects. Specify the Project Nature. If the poject does not exist or it does not contain any nature, you must select at least one nature. This way DVT will compile the respective sources.